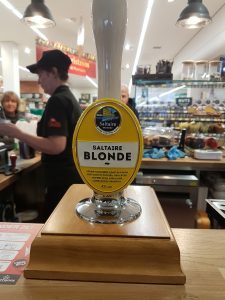 If you have been in to Morrisons, Guiseley this November you will have a seen something new that you would not expect to find in a UK supermarket. If not, then it is worth taking a visit to make up your own mind about the newest addition to the store. 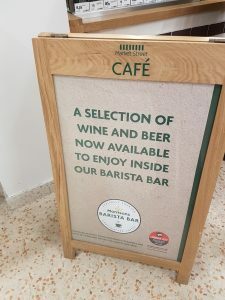 Over the last year Morrisons has been through a huge change with new coffee bars, mini store fronts in their market area, and a new look throughout the stores themselves. Morrisons has now decided to take that change a step further and introduced a new Bar area within their Coffee Bars. Serving a limited number of alcoholic beverages, this bar will provide customers an alternative to a cuppa before/after the shop, and so far it has been a hit. Morrisons in no way want to become a pub, or build a reputation as such. What they want to do is diversify into new markets with potential plans of date night dining with alcohol beverages in their café area. The influence for this diverse idea is continental Europe and their penchant for cultured alcohol drinking. Where it is more acceptable to have a glass of wine with breakfast, purely due to its importance in their culture rather than to get drunk. It is seen more of a sophisticated, moderated approach to enjoying alcohol then a night out in a bar with shots and cocktails. This is why Morrisons have limited the beverages on offer, and chosen to set prices to deter people from sitting and drinking for hours yet still be affordable to their current market. 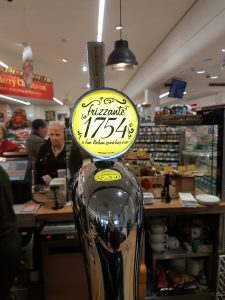 Alcoholic beverages currently on offer are Saltaire Blonde and Fizzante 1754 Prosecco on tap, Peroni, Aspall Draught cider as well as a red and white wine. When approached regarding concerns of drinking alcohol in a family friendly environment the staff were quick to reassure us that they will not be serving alcohol to anyone who already appears to have been drinking beforehand, and will not allow patrons to sit and drink for hours. The aim is to simply provide a quick drink to those awaiting upon another shopper, or post/pre- shopping drink for shoppers. They understand that people may have a drink and then leave to drive home, however just like at a bar it is up to the individual to be responsible for their actions. Morrisons will help facilitate safe drinking by monitoring alcohol consumption where possible. 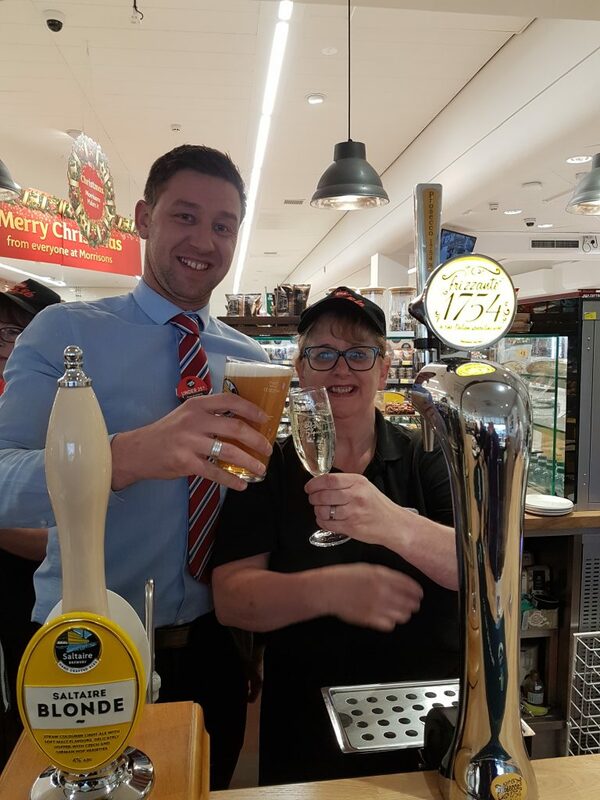 It is definitely an unusual direction for a supermarket such as Morrisons to take, but based on current sales in the past week, it has been a big hit with customers and so far there has been no incidents reported due to alcoholic consumption. 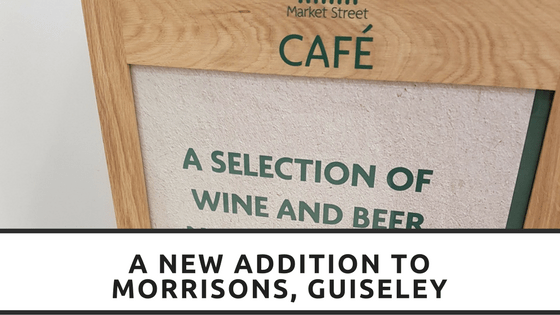 We at Guiseley Gazette, will be very interested to see how this goes in the coming months and will keep in contact with staff at the store to find out. Do you think this is a good move on Morrisons part, or do you have concerns you feel need raising? Morrisons are open to feedback before rolling it out in to other stores, so any comments will be passed on to them to take in to consideration.